Home » Characters » Kenny Bania – It’s The Best Jerry! The Best! 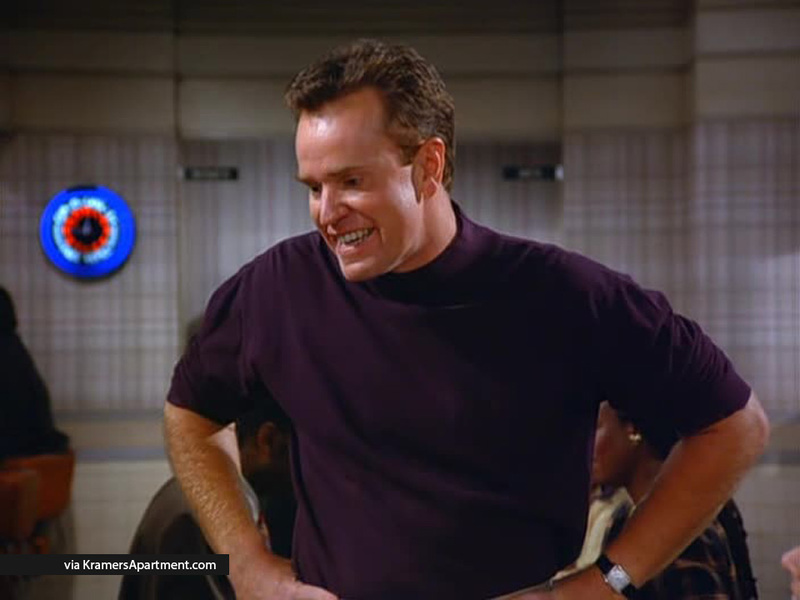 Kenny Bania is a fellow New York comedian played by Steve Hytner. Jerry considers Bania to be a hack and avoids him whenever he can. 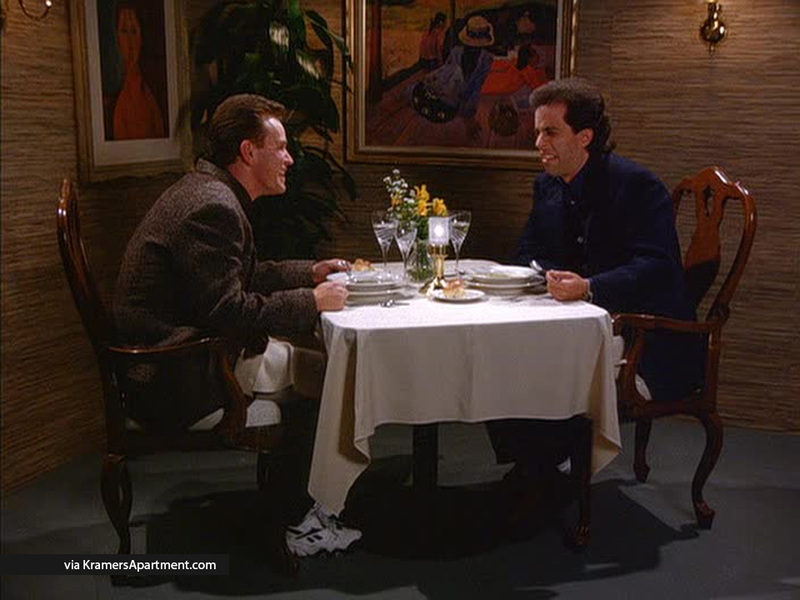 Bania weasels his way into having dinner with a reluctant Jerry on several occasions at his favorite restaurant, Mendy’s. He is also known to ride Jerry’s coattails; following his act after Jerry warms up the crowd and even dating one of his old girlfriends. Jerry ends up mentoring Bania and helps him write the famous Ovaltine joke. Bania offers Jerry a brand new Armani suit and he doesn’t even want anything for it… well, except that Jerry buys him a meal in exchange. Reluctantly, Jerry accepts the offer and takes Bania out to eat at Mendy’s, but Bania only orders soup, which he says doesn’t’ count as a meal. Later, while at the coffee shop, Bania joins George and Jerry in a booth and orders a soup and sandwich. Having ordered soup and a sandwich, Jerry feels he has fulfilled his obligation, but Bania disagrees as they didn’t eat in a fancy restaurant like Mendy’s. 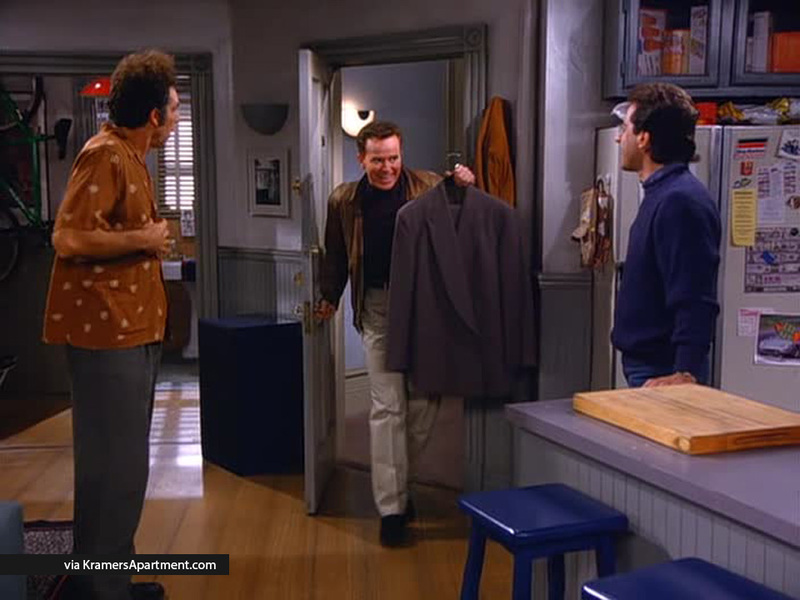 In order to get rid of Bania and his guilt-tripping, Jerry offers the Armani suit to Elaine’s boyfriend, Simon, who willingly accepts it. Elaine and Kramer go to Barney’s so Elaine can try on a dress and Kramer can purchase the moisturizer that he wants. 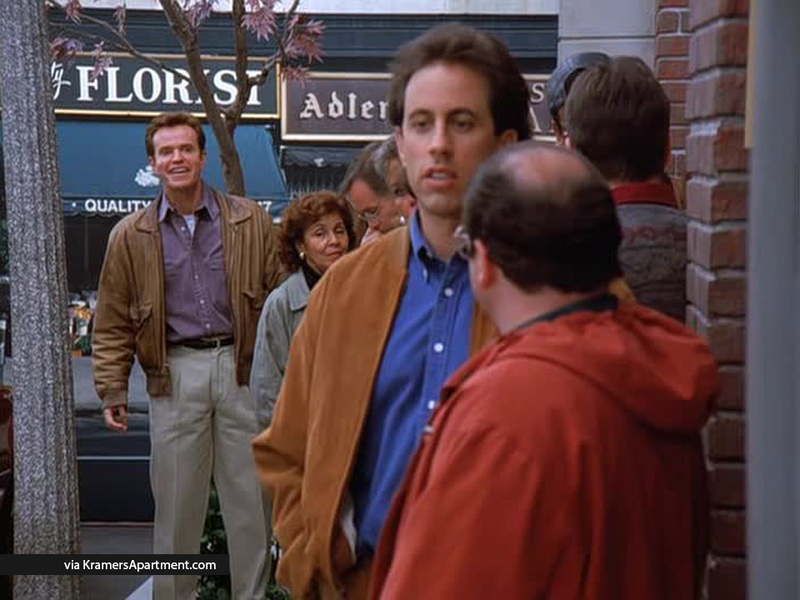 At the store, Bania is looking for a new suit, and he purchases the clothes off of Kramer’s back for a cool $300. Kramer is left in in the women’s dressing room in nothing but his underwear, so he tells Elaine to ask Jerry to bring him clothes. Jerry brings him a change of clothes and asks Kramer for the dry cleaning ticket that was in Kramer’s trousers which are now in Bania’s possession. 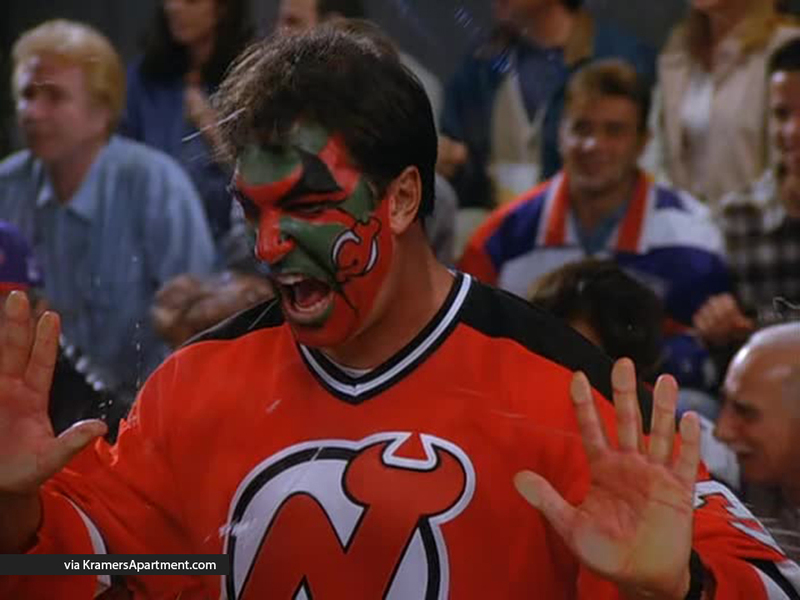 However, Bania wants his money back for the suit because it was stained by Kramer’s moisturizer. 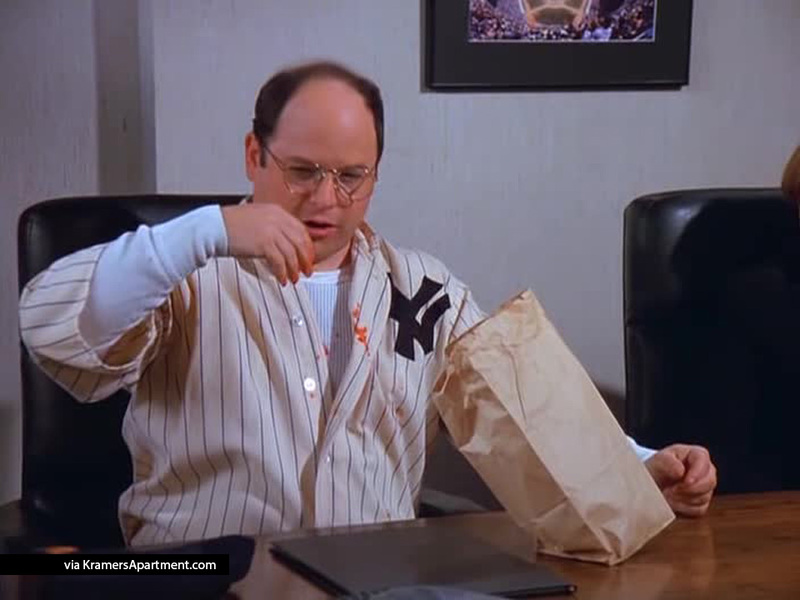 Jerry, only interested in the ticket, agrees to pay Bania two meals at Mendy’s in exchange for the dry cleaning ticket. Jerry is dating a new girl, Abby, and is intrigued by the concept of her having a mentor. Jerry eventually meets her mentor, Cynthia, but finds out she is dating Kenny Bania. After seeing Bania’s act, Abby is unimpressed and loses respect for Cynthia, eventually firing her as her mentor. Cynthia dumps Bania because of his poor act, and he turns to Jerry for advice, and Jerry agrees to be his mentor. Jerry helps him with his material and comes up with gold. Jerry believes that Kenny Bania is riding his coattails and that his act is only working because he goes on after Jerry. He also begins to date one of Jerry’s ex-girlfriends, Jenna. When Bania is scheduled to follow him on the NBC showcase, Jerry plans to take a dive so that Kenny’s act will also bomb. After Bania’s act, two NBC executives offer him a pilot on NBC, thinking Kramer and Newman running onto the stage was part of the act. 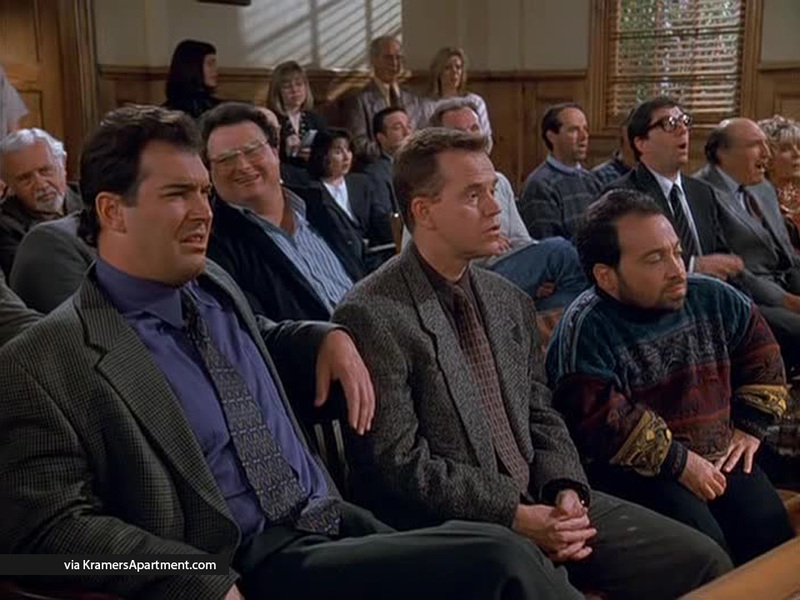 Kenny Bania is seen at the trial of Jerry, George, Elaine, and Kramer. Jerry: Oh no, it’s Kenny Bania. Jerry: Oh, he’s this awful comedian. Jerry: Hey Kenny, how’s it going? Bania: Great. I’ve been working out. Went from a size 40 to a 42. Bania: Yeah, I’m huge Well, I’ll leave you guys alone. Bania: Oh. Jerry, You know what just hit me? I was thinking — What size suit are you? Jerry: Ahh, I’m a 40. Why? 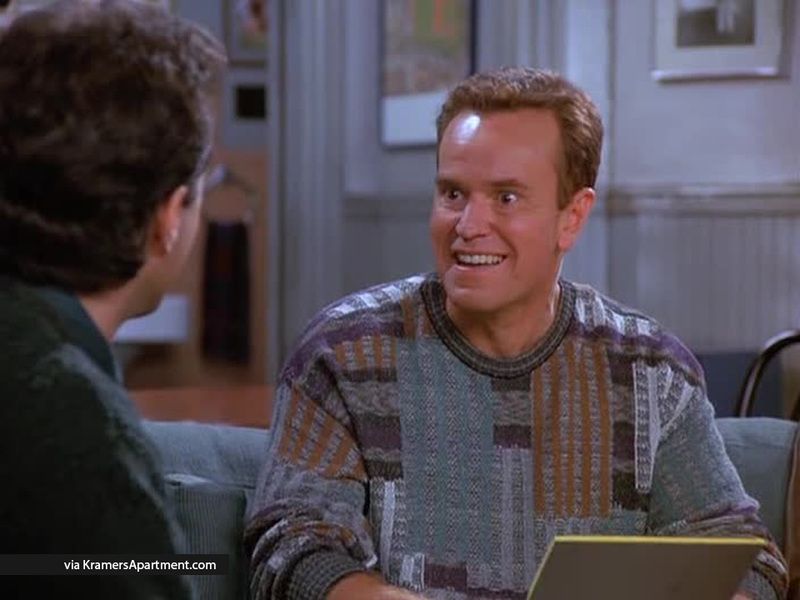 Bania: I just got a brand new Armani suit — doesn’t fit me anymore. Do you want it? Bania: Oh come on. Why should it just sit in the closet? Bania: You gonna be home later? Bania: I’ll drop it off. Bania: You didn’t think I was really going to give you a suit, did you? Kramer: What, you’re giving him this suit? 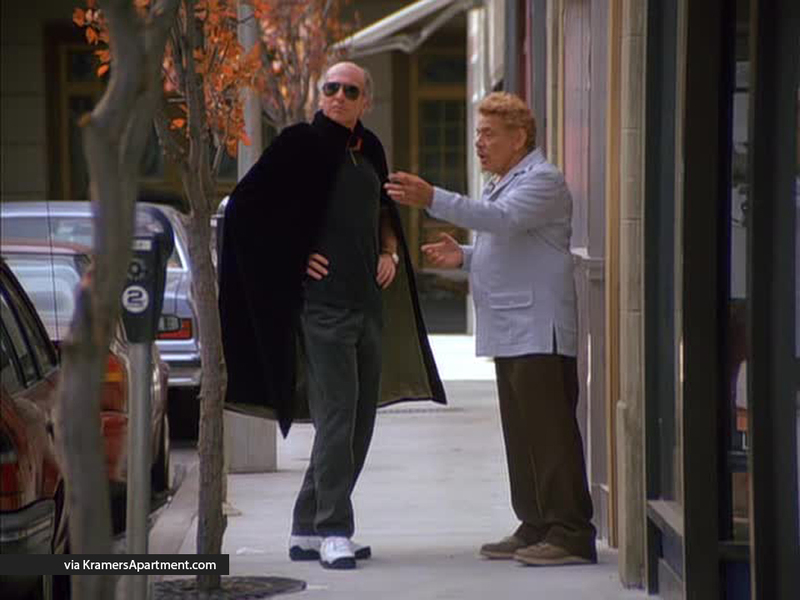 Bania: That’s right, and it’s an Armani. Kramer: Armani? Hey, Armani Jerry. Jerry: Yes, yes, I heard. Kramer: Come on, try it on. Kramer: Come on, I want to see how it fits. Jerry: Ok, Yeah all right. Kramer: Oh boy, that looks great. I can’t believe you’re giving him this. Bania: I don’t even want anything for it. Kramer: He’s very generous, isn’t he? Jerry: Yes, yes, he is. Bania: I’ll tell you what — you can take me out to dinner sometime. Kramer: No, you’ll never get a better deal than that. Bania: All right. I’ll leave you alone. Bania: Hi, Jerry. It’s Kenny. Bania: You know, I was thinking if you’re not busy, maybe I could get my meal today? Jerry: Yeah, you wanna get that meal, don’t you? Bania: How about Mendy’s, ooh, ever been there? Bania: Ah you’ll love it. I’ll meet you there around 7:00. Bania: I start out with curls. That’s good for the bicep. (motions with 2 fingers along his right bicep) I do 10 reps, 2 sets. Bania: You work out with weights? Bania: Ahh, you know what I think. I’m just going to have soup. Yeah, I’ll save the meal for another time. Jerry: Another time? What other time? Bania: I had a hot dog earlier. I’m not that hungry. Jerry: No, no, Bania, no. This is the dinner. The soup counts. Bania: Soup’s not a meal. You’re supposed to buy me a meal. Jerry: I’m not stopping you from eating. Go ahead and eat. Get anything you want. Bania: I don’t want anything but soup. Jerry: Then that’s the meal. Bania: But I had the hot dog. Jerry: I didn’t tell you to have a hot dog. Who told you to have a hot dog? 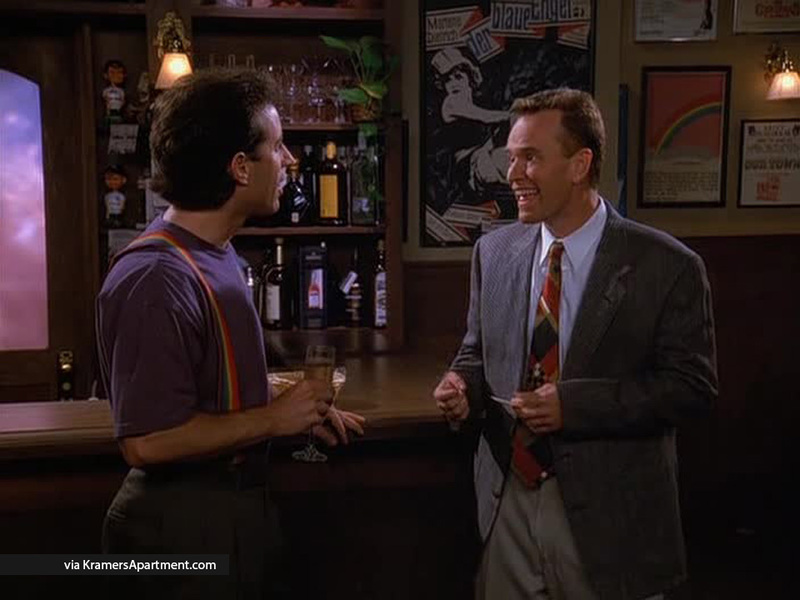 Bania: Hey, I give you a brand-new Armani suit, and you won’t even buy me a meal? Jerry: All right, fine. Get the soup! Bania: You worn the suit yet? Jerry: Actually, I did. I put it on last night and slept in it. Jerry: … Oh, I’m joking. Bania: OH! Ha ha ha ha ha ha ha ha. Can I squeeze in? Kelly the Waitress: Can I take your order? Bania: What kind of soup do you have? Jerry: Why don’t you get a sandwich? Bania: Ok, I’ll have tomato soup and ah, tuna on toast. Jerry: OK … This is it ‘cha know. This is the meal … so stock up buddy boy. Bania: What are you talking about? this isn’t a meal. Jerry: Yes it is. Soup and sandwich. That is a meal. Bania: You’re supposed to buy me dinner in a nice restaurant, like Mendy’s. Jerry: I tried to do that. Bania: Ah, soup and a sandwich for a brand-new Armani suit. Is that any kind of gesture? Bania: Listen, Jerry, I’ve been doing some thinking. I want my suit back. Jerry: I don’t have your suit. I gave it away. Bania: Well it’s my suit. Jerry: Well it’s gone. I’m sorry. Good-bye Bania. Kramer: Hey Bania, what’s happening? Bania: I’m looking for a new suit. I can’t find anything I like. That’s a nice suit. Bania: Did you get that here? Kramer: No, this is vintage. They don’t make this stuff anymore. Kramer: That don’t make you look high-waisted. Bania: What size are you? Bania: 42, That’s what I am now. I’ve been working out, I’m huge. How’d you like to sell it? Kramer: Make me an offer. Kramer: Look at the stitching. This is old world craftsmanship. Kramer: Sold. Follow me into the dressing room. Bania: You throw the shirt in? Kramer: Bania, you’re killing me. Bania: Hey that’s the women’s dressing room. Kramer: There’s nothing in there that I haven’t seen before. Jerry: I got an idea. Jerry: I can’t believe I’m gonna do this… Bania, can I talk to you for a second? How’s everything going? Bania: Well all you gotta do is tell Kramer to give me my money back, and you’ll get your ticket. Jerry: Yeah, yeah all right, well uh … tell you what I will do Bania — you give me the ticket, and uh, I will take you out for a nice dinner. Bania: Can we go back to Mendy’s? Jerry: You want to go to Mendy’s, I’ll take you to Mendy’s. Bania: Twice? I wanna go twice. Jerry: all right let’s be reasonable, Bania. I’m taking you out for a nice dinner. All I want is a little ticket in that pocket. I think it’s a pretty good deal. Jerry: . . . All right. Just give me the ticket. Bania: Mmm. This soup is great. Jerry: Yeah, it’s very good. Bania: I told you Mendy’s had the best pea soup. The best Jerry, the best. Are you enjoying it? Jerry: Yeah. I’m having a wonderful time. Jerry: Yeah, yeah I know. This would be good, but it would be the same. But if we go someplace else, it would be different, but it might not be as good. It’s a gamble. I get it. Bania: Hey, Jerry! I didn’t know you liked soup. Bania: This guy makes the best soup in the city, Jerry. The best. You know what they call him? Soup Nazi. Jerry: Shhhhh! All right, Bania, I – I’m not letting you cut in line. Jerry: Because if he catches us, we’ll never be able to get soup again. Abby: Jerry, this is Cynthia Pearlman, my mentor. Cynthia: Great, my boyfriend’s just parking the car. Actually, Jerry, you might know him, he’s a comic too. Bania: Hey, Jerry!! How’s it going?! You gonna join us for dinner? The duck here’s the best. The best, Jerry. Jerry: Oh, that’s too bad. Bania: Maybe she’s right. Maybe I am a complete hack. I’m the absolute worst. The worst, Jerry. Bania: Why do they call it Ovaltine? The mug is round. The jar is round. They should call it round tine. That’s gold, Jerry! Gold! Bania: Killed. I’m gonna go pick up some chicks. Good looking ones, too! Jerry: Because I killed first and warmed up the crowd. He’s like that fish that attaches himself to the shark. George: And you’re the shark? Jerry: Yeah, I’m the shark and he’s the fish eating my laughs. Jerry: Oh my god, it’s Bania and Jenna. Jerry: The toothbrush in the toilet bowl. Bania: Hey Jerry, this is Jenna. Pretty good lookin’ huh? Jenna: Jerry’s the guy that I dated right before you. Jenna: Don’t worry, Kenny. After dating Jerry, you’re a pleasure. Bania: Hey Jerry, did ya see it? Two men in suits walk in and introduce themselves. Kenny. Really funny out there. Bania: How about that Jerry? First, you had a pilot on NBC and now I’ll have one. Looks like I’m following you again. Jerry: Oh, I’m gonna puke. Bania: Puke? That’s a funny word. Can I use that?